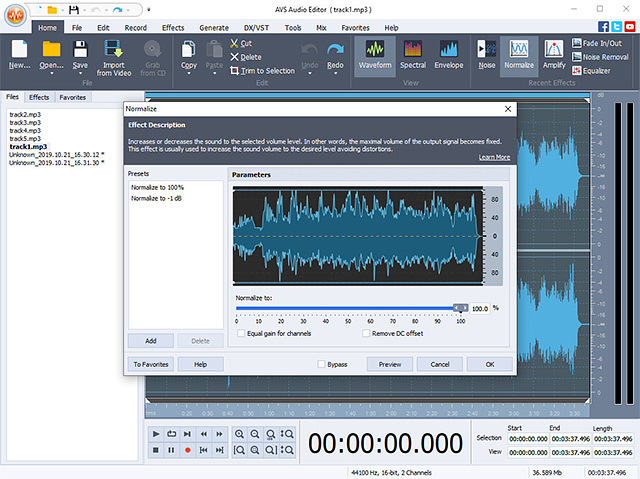 AVS Audio Editor is a perfect tool for audio editing. Edit and save audio files in MP3, FLAC, WAV, M4A, WMA, AAC, MP2, AMR, OGG, etc. with AVS Audio Editor. Use specially designed filters to remove irritating sounds like roaring, hissing, crackling, etc. Select between 20 built-in effects and filters including delay, flanger, chorus, reverb, auto correction and more. Mix audio and blend several audio tracks. Record audio data from various inputs like microphone, vinyl records, and other input lines on a sound card. Extract and edit audio from your video files with AVS Audio Editor. Save them on PC or external hardware. Use batch editing to apply certain settings to several files at one go. Smooth unwanted hiss with Noise Reduction filters. Edit an audio track and create your own ringtone for iPhone. Work faster - make up a Favourites panel with the most frequently used functions. AVS Audio Editor is a part of the AVS4YOU package. Register once and work with all tools from the AVS4YOU.com. Subscribe for $39/year or $59/lifetime. AVS4YOU tools let you easily rip, convert and edit audio/video files, burn DVDs, create ringtones, upload videos to portable devices, players, phones and much more!